If Netflix's Queer Eye ever features a celebrity hero (what the show calls its "make-better" subjects), we know one actor who will sign right up: Justin Theroux. In addition to several social media posts over the past few months featuring three members of the Fab Five (Jonathan Van Ness, hair and grooming expert, Antoni Porowski, food and wine expert, and Tan France, wardrobe expert), it seems like everywhere Theroux goes, he can't help but gush about his new BFFs. On Monday, when Theroux appeared on Jimmy Kimmel Live, he told Kimmel that he first met Van Ness after "sliding into his DMs" on Easter. Then he chatted with Entertainment Tonight on Thursday and went a bit more into detail about how their friendship developed. "It really happened when I saw the show and I fell in love with them," Theroux told ET. "I was just a big fan of the show and then it happened one Easter. Jonathan came over and we had a little bit of Easter together and then it turned into kind of like a regular clutch hang out." 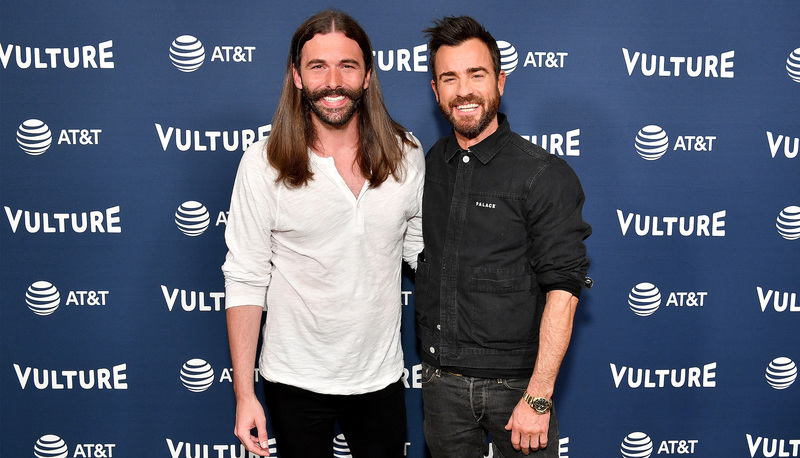 Through Van Ness, Theroux also met and became close with Porowski and France, although he admitted that only Van Ness has (at least so far) given him any life-changing advice like they do on the show. "Antoni was finally able to come over and then Tan was finally able to come over," Theroux said. "And the other two I haven’t met yet but I’m looking forward to that." He added, "Johnny, Jonathan went back to my bathroom at one point when he was getting his hair ready, so I got to watch him do that big gorgeous mane of his. He gave me some tips. He gave me this like surf comber stuff from Oribe to put in my hair and he told me to get it and I did. We've already tipped each other a little bit." Although Theroux told ET that Van Ness has already helped him, he admitted that what he really wants is for Porowski to cook for him. He told Kimmel on Monday's show that whenever "the guys" are coming over, he tends to over-prepare. Even nachos made by Porowski would probably taste like a dream. We're hoping Theroux gets his wish for more time in the kitchen with the food and wine expert — perhaps next Easter? We're also eager to see how he gets along with Karamo Brown, culture expert, and Bobby Berk, interior design expert. This burgeoning friend group is just too sweet.